Our canine pals deserve a little extra TLC sometimes, don’t they? 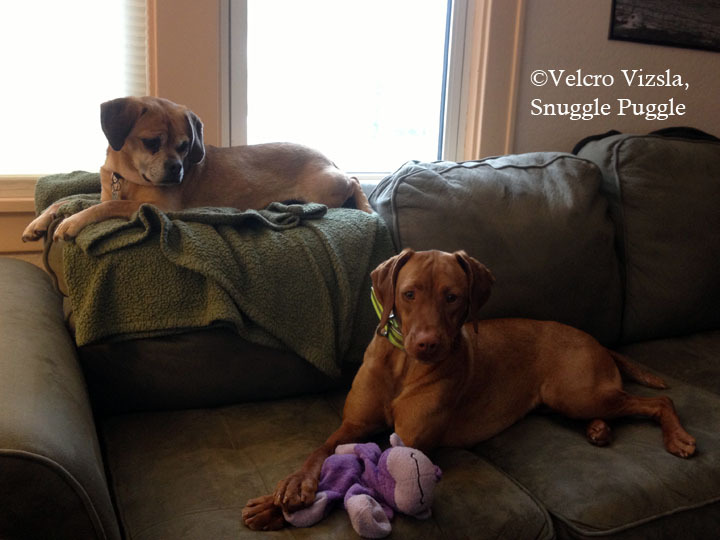 Our snuggly Puggle, Baxter, and our sweet, happy-go-lucky Vizsla, Looper, sure do. Sometimes I want to pamper them, but just as I bake only healthful, nutritious indulgences for myself and the Midwestern Gentleman, I also want to feel good about what I am feeding our pups. 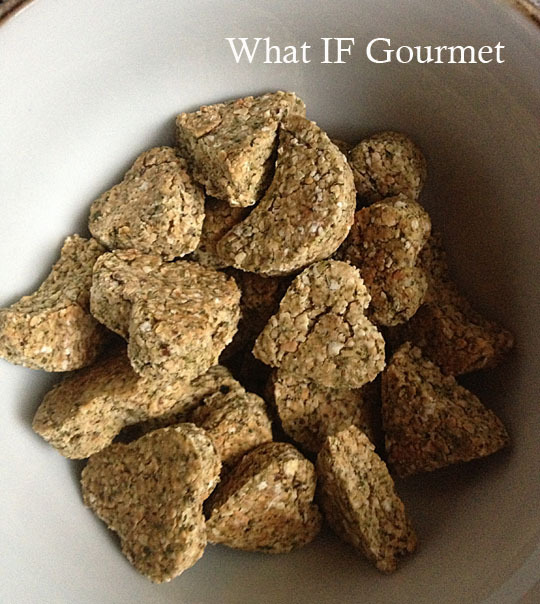 These treats are free of wheat and dairy, which are two common canine allergens. They contain peanut butter, which is so beloved by Baxter that he comes running before I’m even finished unscrewing the jar. They also contain parsley and mint to freshen up doggie breath — a very important addition if your dogs consider the cat litter box to be a candy dispenser, as mine do on the rare occasions they can get access to it. 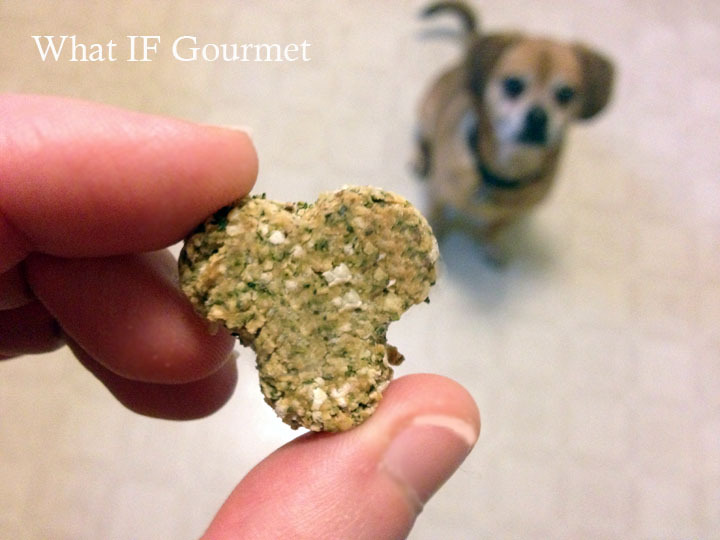 Ground flax is arguably a useful supplement for dogs who suffer from arthritis, too. There’s plenty of anecdotal evidence on the internet to that effect, although the scientific jury is still deliberating. If you’re a regular visitor to this blog, then you know how I feel about added sugar (My Sworn Enemy!) Sugar is even worse for our canine pals than it is for us, so make sure to read the label on your peanut butter jar and choose a variety that has no added sugar. Beware sugar’s other aliases, as well, such as corn syrup and maltodextrin. My preferred peanut butter for this recipe is the grind-it-yourself version from our local food co-op. Knowing that I collect unusually shaped cookie cutters, a friend of my mom once sent me this set of vintage canape cutters, perfect for shaping cheese into tiny hearts and spades for meetings of your ladies’ bridge club ca. 1950. I love them. Dogs don’t care if their treats are well-shaped or not, but the cut-outs do make these biscuits a pretty gift for the dog-lover in your life. If you want to skip the fancy, then just roll out the dough and cut it into 1″ bars instead. These treats can be stored in the freezer for a few months, or in an airtight container (at room temperature or in the refrigerator) for one to two weeks. They have been rigorously tested and approved by Baxter and Looper. Preheat the oven to 350 F. Combine the flax and hot water in a small bowl, stir thoroughly to combine, and let sit until the mixture gels up, about 5 to 10 minutes. 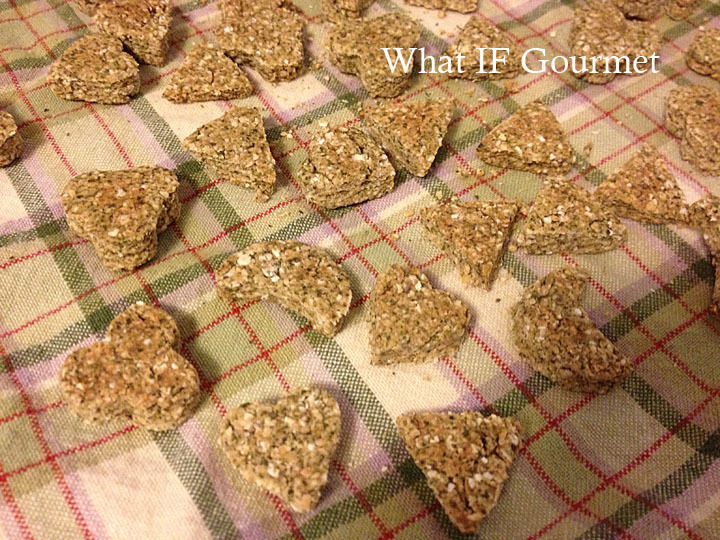 Measure the rolled oats into a food processor and pulse until they have the texture of a coarse flour. 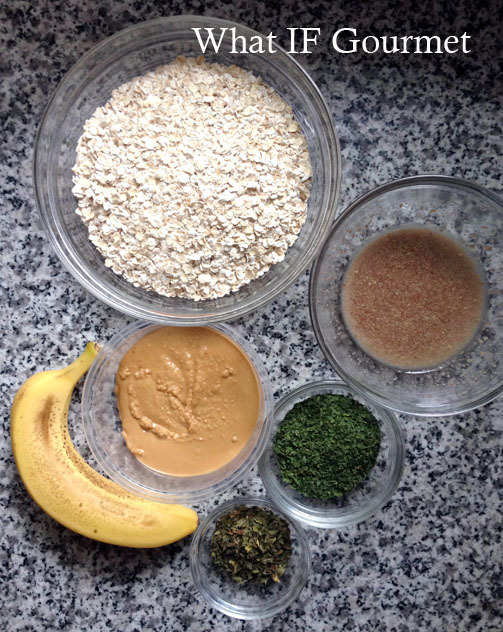 Add the remaining ingredients, including the flax gel, and pulse until uniform in texture. 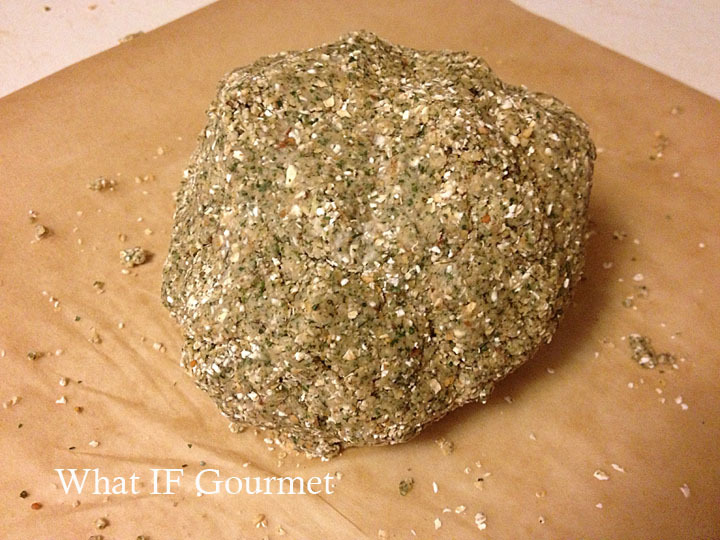 Gather the dough into a coarse ball and flatten with the heel of your hand on a sheet of parchment paper. Roll the dough out to about 1/4″ to 3/8″ thickness. Cut the dough into shapes with a cookie cutter or just cut the flattened dough into 1″ bars. Transfer to a baking sheet. Bake for 20 minutes, flip the biscuits, and then bake for another 20 minutes, until hard and dry. Let cool completely and store in an airtight container. These treats can be frozen for several months. Makes about 6 dozen bite-sized treats. 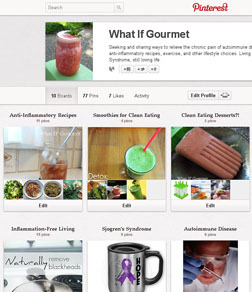 This entry was posted in Anti-Inflammatory Ingredients, Dairy-free, Gluten-free, nuts, Recipes, Snacks, Vegan and tagged dog treats. Bookmark the permalink. I may have to try this recipe out on our dogs since I will have more time for cooking this summer!! Thanks for the recipe!! I collect cookie cutters, too! 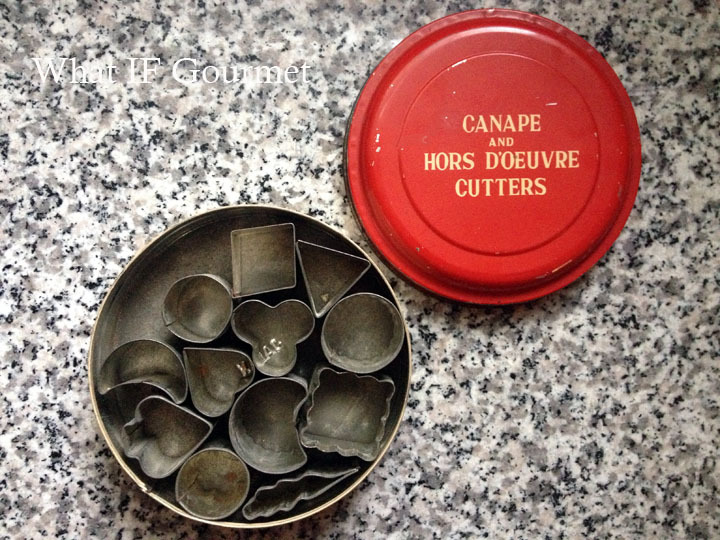 and I have that very same tin of canape cutters.